Thanksgiving’s trottin’ up fast. My Turkey Day celebrations have changed dramatically since having a couple of kids. It’s been years since I’ve made a homemade pâté de campagne or boned out a duck. I let friends and relatives take over most of the cooking now. I contribute what I can manage and there’s still plenty to go around! Today’s the last day for HEB’s incredible deal on Texas sweet potatoes at 19¢ a pound, as well as specials on Texas green beans for 77¢ a pound (casserole!) and Texas apples—cameo (love those cameos) and fuji—going for $1.27 per pound. Put a pomme in you pie or add apples to your stuffing. 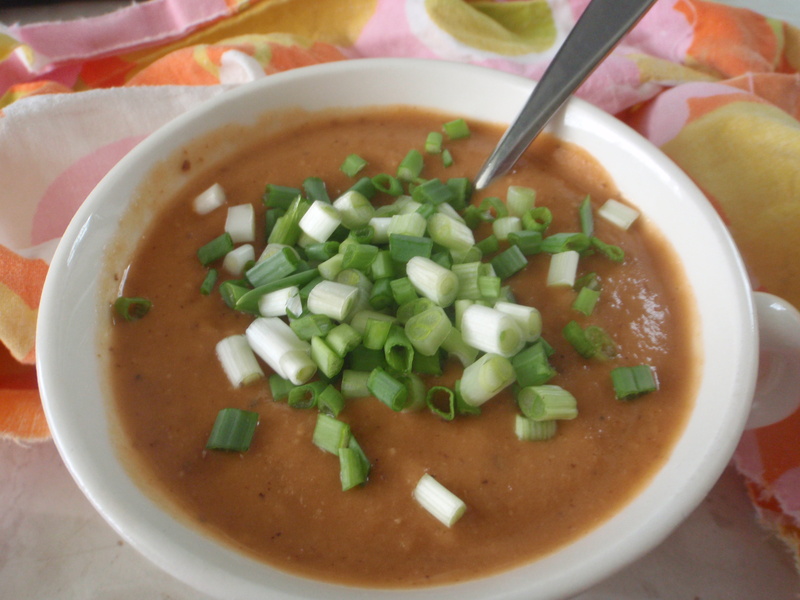 In the years BC (before children) I always cooked up a Peanut Butter Sweet Potato Soup as one of the big meal’s starters. My Thanksgiving spread showcased New World foods, and this recipe, with its sweet potatoes, jalapeño, tomato juice and peanut butter, kills four birds with one tureen! I won’t be making it this year, but folks with a little more time on their hands (this is an easy soup) can enjoy this rich, warming precursor to the main event. a couple or so cloves of garlic, minced. Local has about dried up. I go for domestic organic. 1 local jalapeño. Leave whole if coddling delicate palates. Otherwise, chop it up! 1 rib of organic celery, chopped. Local isn’t available yet—Edgar of Finca Pura Vida says it’ll be about three weeks. But you’ve probably already bought this holiday cooking staple, anyway. 1 cup chopped organic carrots. Inexpensive year ’round, another holiday must-have. a couple sprigs of fresh thyme. This herb’s easy to grow (most are), but you can buy fresh Texas-grown herbs at Central Market and our farmers markets. Thyme and sage are Thanksgiving essentials! 1 bay leaf—I love fresh (been growin’ it for more than a decade) but dried will do. 2 cups or so chopped Texas sweet potato. I use one medium-sized. I usually don’t bother to peel them. That’s up to you, though. 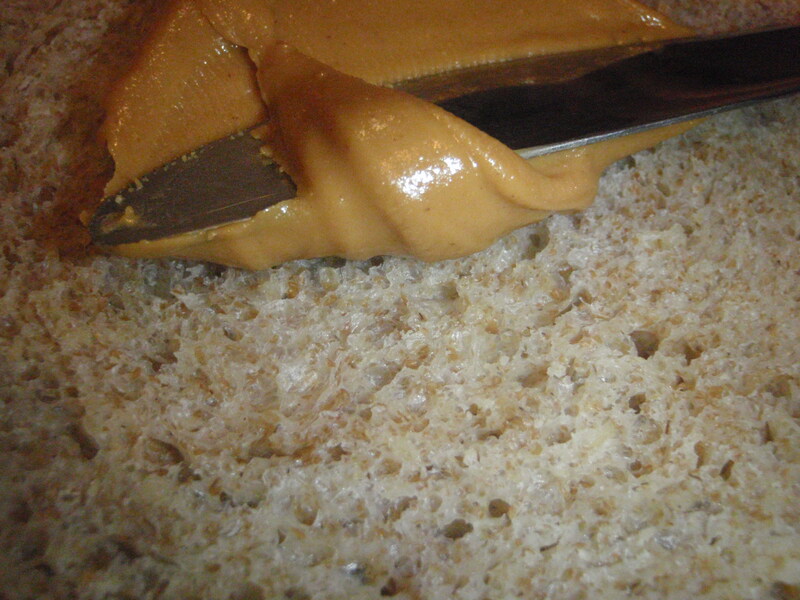 1 cup organic smooth peanut butter. I prefer the “natural” (i.e. not “no-stir”) for this recipe. Use what you have. 1 cup chopped local green onions. I’ve been enjoying Hairston Creek Farm‘s lovely scallions lately. If you didn’t buy any this weekend you can still shop for all kinds of local produce (and meat and eggs and dairy) at the Austin Farmers Market at the Triangle this Wednesday, with extended hours from 3pm to 8pm. Put a little local on your table! Heat up the grease in a big soup pot and saute the onion over medium heat just until translucent. Add the rest of the aromatics, through the bay leaf, and saute a couple minutes more. 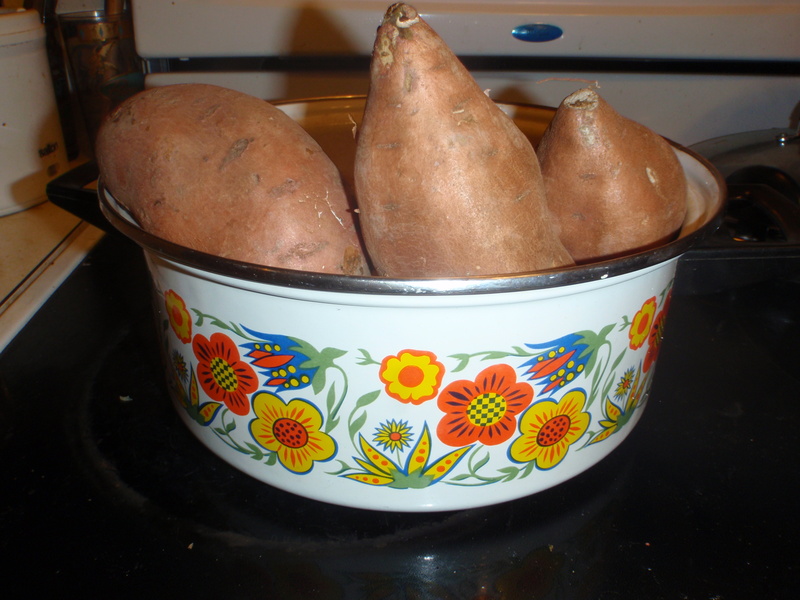 Dump in the sweet potatoes, salt and water, turn the heat up high and bring to a boil. Reduce the heat and simmer, partially covered, until the vegetables are tender, about 15 minutes. Carefully puree the soup, adding the tomato juice and peanut butter, in your blender until smooth—exercise caution when blending hot liquids. Return the blended soup to the pot and taste for sweetness, adding turbinado sugar if necessary. Reheat over low heat until warmed through. Serve generously topped with the green onions. For a main course, ladle over Lowell Farms Texas-grown organic jasmine rice. We lucky Austinites can purchase Orange Blossom Farms fragrant organic tangerines at both the Austin Farmers Market and Sunset Valley Farmers Market. Texas citrus season is NOW (although my own mandarin tree, laden in its fourth year with at least 50 fruits, is still transforming green globes into the orange of winter’s gold) and I’m sure you’ve already been enjoying Texas ruby red grapefruit (Rio Star) and the Lone Star state’s sweet juicing oranges. Grab yourself a $5 bag of Texas tangerines and a pack of chicken legs from one of our local and sustainable operations and whip up some Chinese-style comfort food. 2 Tablespoons neutral flavored high smoke point oil. I like Spectrum‘s organic peanut oil available at Whole Foods. 1 large local green onion, finely chopped, white and light green parts separated from the dark green parts. Hairston Creek Farm has been selling lovely long-leafed scallions. ½ teaspoon ground, roasted Szechuan peppercorns. You can buy these, whole and untoasted, in bulk at Central Market. Substitute fresh cracked black pepper if necessary. ½ cup broth, preferably homemade unsalted. See Stock Tips. 2 Tablespoons organic white wine vinegar. I use Spectrum. 2 ½ teaspoons organic soy sauce. I like Eden or San-J. Heat up a large heavy skillet over highest heat. When it’s good and pipin’ hot, add your oil, swirl it around and lay in your chicken pieces, skin side down. Brown well on both sides, then remove chicken to a plate and set aside. Pour off all but a Tablespoon or so of the fat in the pan (reserve this flavorful grease for stir-frying tofu or veggies) and put the pan back on the stove at medium-high heat. Bloom your aromatics—scallion whites, tangerine peel and chiles—in the hot fat for a minute then stir in the powdered spices. Add the next six ingredients (through the soy sauce), bring to a boil and simmer for 5 minutes. Add back the chicken, skin side down, cover and simmer on low heat for about 15 minutes, turning the chicken pieces over once, until the meat tests done. Remove chicken from the sauce and raise the heat to medium-high. Stir up a slurry of the cornstarch and cold broth and stir it and the scallion greens into the simmering sauce. It will thicken right away. Stir in the sesame oil or butter. 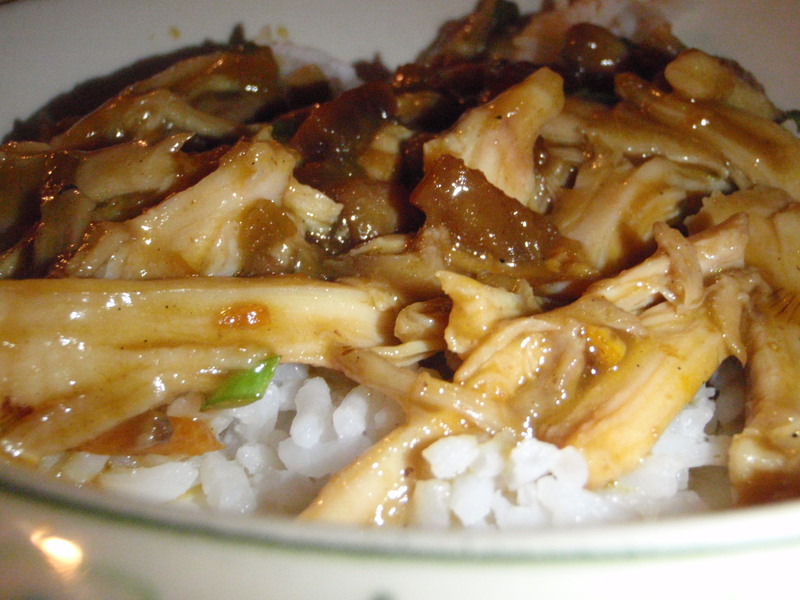 Serve the chicken and sauce with hot Lowell Farms jasmine rice. You can either set a chicken piece atop a mound of rice and nap it with the sauce or, as is my family’s preference, debone the chicken and mix it into the sauce, to be ladled over the rice. Don’t forget to save the skin and bones for the stock pot! Speaking of holidays, just visiting our local farmers markets has me gettin’ into the spirit. Expect to find TWO sources of local asparagus (if all goes well) at Sunset Valley Farmers Market this Saturday: McKemie Homegrown and newcomers Montesino (organic!). Georgetown Pecan Company is back with new crop pecans. Orange Blossom Farms returns with the first of this season’s tangerines. Richardson Farms has been selling pastured turkeys (this weekend they plan to offer fresh again!) plus their own freshly ground whole wheat flour. See below for my bread machine recipe using their Texas-grown wheat! If you’re headed for the Austin Farmers Market this weekend, be sure to check out Dai Due‘s new booth for the crème de la viande: charcuterie (including their famous lard! ), carefully crafted from locally-sourced ingredients. Shop local and get cookin’ so’s you can get to eatin’! You can’t beat a bread machine for convenient sustenance. On workdays, if I have nothing cooked up already, I can just throw some ingredients (good ones, of course) into the bread maker and know that my family won’t starve in my absence. 2 Tablespoons orange juice (HEB’s selling our sweet ‘n’ juicy Texas oranges right now) plus enough water to equal 1 2/3 cups total liquid. The OJ is optional, especially out-of-season, but it helps tame the bitterness some folks detect in wheat bran. 1 ½ teaspoons local honey. We Central Texans enjoy so many apiary options. I’m partial to Good Flow’s local wildflower nectar from Central Market’s bulk department. 2 Tablespoons organic butter. I like Organic Valley. Click for a coupon. ½ cup organic old-fashioned oatmeal or ½ cup plus 1 teaspoon organic quick oats (for an even lighter crumb). 300 grams (about 2 ¼ cups plus a scant Tablespoon) Richardson Farms whole wheat flour. If measuring by volume, stir up the flour to loosen it, then lightly spoon it into your measuring vessels. 130 grams (about 1 cup plus 1 Tablespoon plus 5/8 teaspoon) organic all-purpose flour—Whole Foods 365 is usually the best priced. Put all the ingredients into your bread machine in the order specified in your instruction manual. In my Zojirushi, that would be the order I have listed. 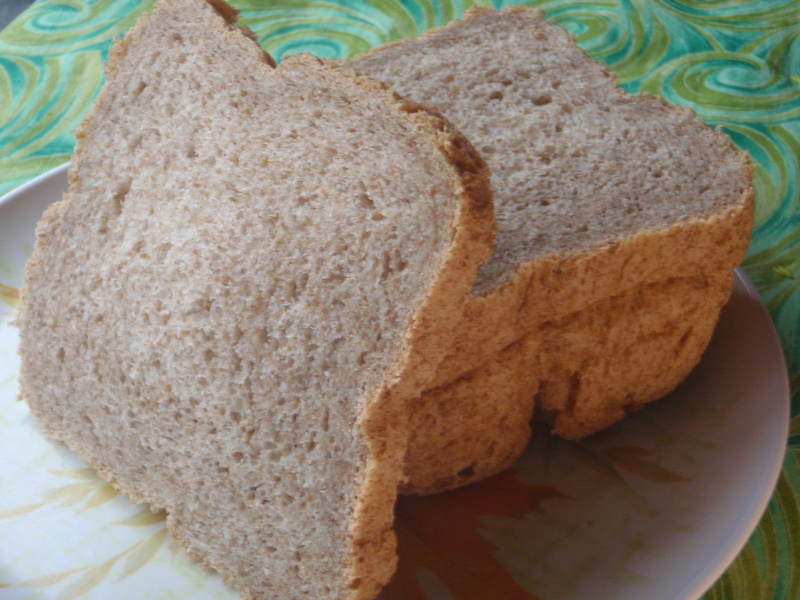 I use the regular cycle (not whole wheat or quick) and get great results. An interesting note about freshly ground flour: Used within 7 hours of milling (some sources say 8-24), the flour should work as expected in your doughs. However, after that initial post-grinding period, enzymes get to working and interfere with the flour’s behavior. I noticed that effect when I made my first batch of bread with Richardson Farms fresh ground flour the day after purchasing it. After storing for 10 days or so (some sources say one week, others claim two), those enzymes settle down and the flour will perform reliably. So I recommend putting that new bag of fresh ground flour in the freezer for a week before embarking on baking. My third batch, baked 15 days after purchasing my flour, baked up the lightest. For quick meals lately we’ve been relying on good old eggs. Actually they’re great eggs ’cause they’re local, laid by free-roaming hens. I believe entomophagy is the solution to humanity’s nutritional problems but usually I prefer to eat bugs vicariously through chicken eggs. Superior protein and Omega 3’s deliciously yoked in yolks. With a stash of boiled organic spuds and baked Texas sweet potatoes in the fridge, this skillet supper almost cooks itself. local onions, chopped how you like. I’m still buying yellows and reds from at the farmers market. Hairston Creek Farm is selling green onions right now and they’d taste fine here. local sweet peppers, cut up as you please. I continue to enjoy the sweet little orange gems from Flint Rock Hill. The baby even eats them raw! Add a spicy chile or two for an NC-17 version. I’ve spied some bright habaneros at the markets lately. Their fruitiness would complement this hash. a Tablespoon or two of tasty fat. Bacon or poultry drippings, or Dai Due‘s decadent lard work perfectly. Be sure to look for the Dai Due booth this Saturday (Nov. 7) at the Austin Farmers Market. Olive oil is fine—try Texas Olive Ranch. 1/2 a good-sized Texas sweet potato, cooked. I prefer to bake mine, three or four at a time. The toaster oven works great and I find that the cooked tubers keep very well in the fridge. ¼ to ½ teaspoon dried thyme or a teaspoon or so fresh. ½ teaspoon good quality curry powder. 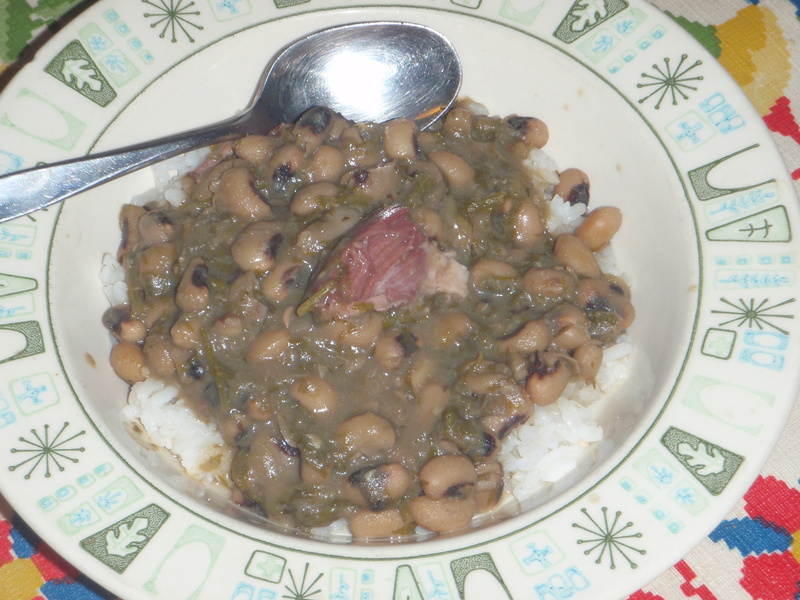 My Caribbean blend plays nicely with the other flavors in this dish. local cheese. We love Full Quiver Farm‘s tangy white cheddar. Happily for Austin locavores, we enjoy numerous cheese choices—pepper jack, feta and chevre, just to name three more that play well with eggs. Saute your onions and peppers (and dried thyme) in your fat of choice until translucent. Smash the potatoes into chunks with the heel of your hand. For homey hashes, I prefer this method over cutting with a knife. I like the rough edges and uneven hunks. Process as you please, however. Add the potatoes, curry powder (and fresh thyme) and a healthy dose of kosher salt (Diamond brand’s my top choice) to the skillet and fry, stirring occasionally, until the spuds are browning delectably. Add the sweet potato (I finely chop the skin and toss it in, too) and mash it around to distribute as the mixture cooks. Pepper it all up with some freshly cracked black, stir it in and push the mixture to one half of the pan. Pour your eggs into the bare side of the skillet and scramble them, using broad strokes to form large curds. When the eggs are almost done to your liking, amalgamate the mass, folding the spud mixture into the huevos. Turn out onto a large serving plate and top with the cheese. Share! Lucky downtowners! Starting November 7, Dai Due plans to grace the Austin Farmers Market with their own boucher booth. Using local and organic ingredients at every possible turn, these folks create honest sausages, pâtés, fresh lard and other meaty goodies to sink your sharp teeth into. Treat yourself to their tasty and sustainably crafted charcuterie. Thanks to Dai Due’s delicious Wurtenberg bratwurst, this quick dinner manifested the convenience of great sausage last night. Satiated, every family member proclaimed this simple supper “superb”! 1 pound bratwurst–preferably from Dai Due. The Wurtenberg is especially yummy because there’s bacon in it. a couple of good sized onions, sliced up. Local alliums are still available at our farmers markets. a couple or so sweet peppers, stemmed, seeded and sliced. I like Flintrock Hill‘s golden Anaheims. a couple or more cloves of garlic, roughly chopped. Morning Glory Farm keeps showing up with bulbs and Hairston Creek Farm has elephant garlic. 3 medium potatoes, cut into bite-sized chunks. Sprouts is selling 5# bags of organic russets for $2.99 through Wednesday. a couple sprigs of fresh thyme. My thymes have been enjoying the rainy weather lately. Heat up your big (12″) skillet smokin’ hot, then add the oil. Quickly swirl the pan and add the sausage links. Get ’em browned on four sides and remove the sausages to a plate. Add your onions and stir them for a minute. Add your peppers and stir again. Sprinkle in some salt and let the veggies soften, stirring occasionally. Put in the garlic and give it a stir. Add the potatoes and herbs, stir ’em around some and pour in the broth. Bring to a boil on high heat, cover and lower the heat a bit. Cook until the potatoes are done. Add water or more broth if necessary. Put the sausage back in, sliced or not, and poach until cooked through—don’t overcook. Pepper up your helpings and serve with as much Full Quiver Farm’s lacto-fermented sauerkraut as you like—I like a lot!